Solar Web Page > Categories > DIY Solar Experimentation & Performance > 2-Screen versus Hammock Filter Matchup! Any worries about breathing the fibers? I know Gary from Build it solar was talking about using filter material but I have not seen any results yet, though I have not really looked). I know Gary mentioned that he wanted to play with deep mesh, but I haven't heard nor see anything. As far as breathing the fibers, it IS designed for a furnace, so I would imagine air passing through it wouldn't be a problem. 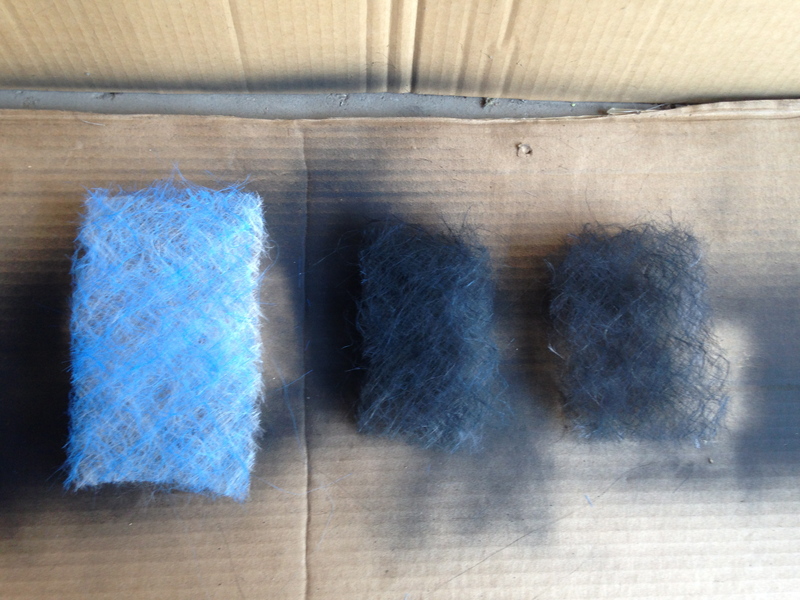 When I separated the white from the blue layer, there was very little shredding and no small particles. The filter is made from very long strand fibers. Kevin Had some concerns about getting paint to the back fibers without getting too much paint on the front fibers. If you look at the two painted samples, One of the samples was painted by separating the two layers and the other was not. I couldn't tell which was which when I was done. I did spray two very light coats from different angles, which did help. Since the difference between the front and back layers is only 1", it probably made little to no difference when painting unless you were either too close or sprayed too heavily. Side-by side test collector is now complete. Hopefully I'll have some test results tomorrow. Sunday I ran a few tests comparing the 2-screen collector to a deep mesh hammock furnace filter. Early numbers are a bit of a disappointment as I expected the Hammock filter to have a performance advantage based on the fact that the mesh had a reported 50 times the fiber strands of screen to better transfer heat to the air flow. Test were run both pushing and pulling the air through the collector. The numbers were roughly the same as the 2-screen performance-wise overall. The hammock filter requires you to wear gloves when handling it to prevent slivers and irritation. The material also needs a lot of quality spray paint for good coverage to make the filter black, while screen might need a light dusting, if any. Pulling air at max fan speed resulted in 21MPH for the 2-screen, and 16MPH for the Hammock Filter. While not something that can't be overcome with an uptick in power, it is something to keep in mind. I think pulling the pad layers apart to make it thinner would fix this issue. The hammock filter is not a bad collector at all. The performance is comparable to the screen, but the 2-screen is a better choice. It's easier to work with and has less resistance. On the other hand, the hammock filter will do a wonderful job of cleaning the air in your house. I used fire extinguishing blanket as a mesh. Only one layer was used. I painted it black with spray paint.